"It's 33 weeks, expected the first week of January. Where, when exactly I don't really want to speak about details," says Italian fertility doctor, Severino Antinori. He told a news conference that a woman was 33-weeks - more than eight-months - pregnant with a cloned baby boy and that the child was developing in an "absolutely healthy" way. Antinori has made similar claims before, but has yet to provide proof. In April, Antinori claimed that he knew of three pregnancies - then in the ninth, seventh and sixth weeks of development - involving cloned babies. He said Tuesday that the oldest of these was about to be born. However, according to his statement in April, the longest pregnancy would have passed nine months in mid-November. Antinori would not explain the discrepancy Tuesday. He also refused to specify if he had any role in the alleged clonings. He did say that he wouldn't be involved in the delivery of the baby, but that he had given a "cultural and scientific contribution" to a consortium of scientists involved in the pregnancies. He refused to identify the scientists. Antinori refused to identify the woman who was to give birth in January or give her nationality. When asked where she was going to give birth, he said only "countries where this is permitted." Antinori, who runs a private fertility clinic in Rome, gained attention in the 1990s when he used donor eggs and hormones to help post-menopausal women to have children. He made world headlines in 1994 when he helped a 62-year-old woman have a child. Experts have repeatedly dismissed Antiniori's claims and say they doubt that he is capable of achieving a cloned pregnancy. Large numbers of doctors and scientists reject human cloning as irresponsible, saying the risk of creating deformed or sick babies is too great and that it poses unanswerable ethical dilemmas. Antinori would not reveal the location or nationality of the woman, but said ultra-sound scans showed the fetus currently weighed 2.5 to 2.7 kg. (5.5 to 5.9 pounds) and was "absolutely healthy." 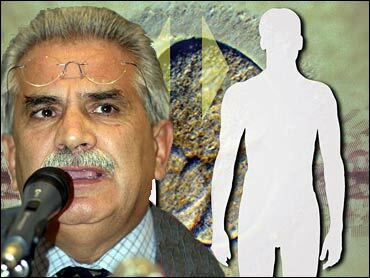 Antinori's former partner, Panos Zavos, can neither confirm nor deny Antinori's claims, but he told The Early Show he is himself proceeding with his plan to clone a human.